It seems like only yesterday that I was taking my camera film to the store to be developed. Then I would return a few days later to discover that I had messed up a lot of the photos with heads missing, people cut in half, badly lit rooms, red eyes making people look like vampires….and I would end up cursing the amount of money I had just spent getting the roll of film developed. But then digital cameras came along and with it came the ability to take a photo and immediately delete it if you didn’t like it. If you did like it, you could upload it to your computer, the Internet, or print it out on photo paper for your granny to put on her mantelpiece. And now digital cameras have been unsurped themselves from the top position by smartphones, which would be considered a serious deficit if it didn’t come with its own built-in camera. Now everyone is snapping away like crazy, adding their own filters and uploading to places like Tumblr, Instagram and Flickr. It seems as if there’s nothing in the world which hasn’t been snapped, tagged, filtered, commented upon, catalogued, pored over, zoomed in on, geotagged, and God knows what else. Our infographic today, courtesy of Overgram.co is about the “mobile phone explosion”, from the very first days of photography, to the Kodak cameras, and finally to the Internet making photography something that anyone can try out, without the need for expensive equipment. Let us know in the comments what you think of the infographic. Also, what was the first camera you ever owned? Do you still use it? 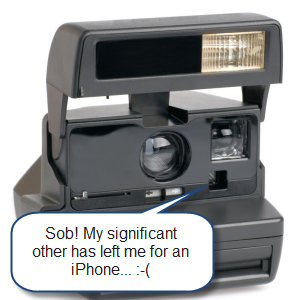 Do you now use a digital camera or have you caved to the smartphone camera craze? Explore more about: Infographic, Instagram, Photography, Smartphone Photography, Twitter. I still have one of those cameras. I think that you can still buy film for it on eBay. Oh Polaroid, we had some good times shaking together. wow! what a fine info-graphic ! I don't care what others say, but Film will always remain superior to digital. Better picture, plus no 'digital noise' on a film shot. I think there's a distinct feeling taking your negatives to be developed and be amazed by the results (whether you're a good or bad photographer). It's a nice surprise and the cost actually make us selective and aim to be better. Nowadays, along with the boom of digital photography we can see half-decent photos produced every day, even those by the lines of 'spot on my wall','blemish on my face', 'toys I want' etc, things that were considered to be unworthy to be photographed years before. From that alone we can conclude, photography has not died. The medium changed, the philosophy changed, but it still stands tall, because everyone like their moments to be frozen in a frame. It's just more accessible to layman. However, no matter how cheap hard drive these days, if I really like certain photos, I'd print them and put them on photo album, because digital data isn't reliable for archival purpose. When I was 12 years old I depeloped my own film and made contact prints from negatives. I joined a local camera club, which we called the Click Club. We had local professional photographers in it also. They gave advice and information to us. That was real photography. With the advent of digital photography I think real photography died. Most people don't know what a darkroom is, other than it is a room that is dark. The same thing happened to Ham radio. I am a Ham and most people think it is Citizens Band and don't know what Morse code is. Progress forgets a lot and neglects too much. Photography is a constantly changing part of our lives that will, I don't think, ever be dead because it is far too adaptable to become a lost art. Will the "rules" change? Maybe, at least to some degree. However, for the ardent photographer the compulsion to record what they see is irresistible. I also have a cell phone with a camera in it. It's not a smartphone....I have too many other electronics that do a decent job of filling in, and at 64 I simply don't have the same tech "needs" as, say, a 20-something LOL.....but it takes a decent pic. However, when my favorite bald eagle flies over my head, I will reach for the DSLR with the 100X400 mm lens, and don't see that ever changing. Some shots are as much about how or why or when you took them, not what you used to take them. For my wallhangers, though, I want the DSLR. At the same time all mobile phones have cameras and people seems to use them the big camera companies like Canon, Nikon, Hasselblad, Leica... produce a lot of expensive digital cameras and lenses. This is a pretty biased infographic considering its made by a smartphone photography app maker. other than the blatant self advertising this is okay but does not mention the huge jump in quality of picture when using decent professional photographic equipment i.e. an slr. We dont go out and spend 2-3k on a camera and lens for no reason. photography is not dead it just means with the abundance of crap pictures taken by smartphone users, real photographers with quality pictures are harder to come find there are just as many of us but the haystack keeps getting bigger while the needles still in there. the problem with everyone being able to take average pictures and throw them in an app is everyone thinks there a pro photographer. It got reduced because of 70% of photos on made 30% of people to take photos and 70% to look if they are capturing the same photo. As it clearly shows in the infographic, technology to take picture will change over times but photography will always remain an art form, everybody will do it with different forms but a few will surpass the form itself. I still think about how people react when first being photographed, and when its a good social tool ... I'm sure I'm not the only one that has heard about tribes being afraid of their souls being taken? In the modern world, some people get very photogenic as they have managed through ubiquity of technology. There, I've said it. ..and then there are signs in Japan warning about up skirt photography..it gets very cramped on the metro. I should know, I've seen pictures on the internet, so it must be true *cough*. More is not better, is it? I wonder if people worried about painting being "dead" when photography was invented? People still paint, and people who love photography will probably continue to take photos, with cameras, because they prefer the quality of the images. I still have rolls of undeveloped 35 mm film they are probably ruined but one day i'll get them developed and see whats on them. so I think even though there is alot more photography going on, the professionals will always do it best. Sorry for the horrible grammar in that last post. I'm so ashamed. Wow this brings back the memories. My first camera was a hand me down from my older brother and it was a Pentax point and shoot - slim and light it went everywhere with me. And boy do I agree with the cutting off heads part... I must have cut off more heads than the dreaded Guillotine ever did. The difference by this present is that Cameras like the Polaroid, still expensive, and the revelation of photos, on rolls still complicated to use.